This is a real viking stool. We have many archaeological findings of this kind of stool. Lots of sizes and shapes, even some with a hole in the seat probably used as a toilet seat.The common characteristics of the stools is the D shape and the 3 legs. Two in the corners of the straight side and the 3rd leg in the middle of the round side. This stool is some places refereed to as the Lund Stool because one particularly intact seat was found in Lund. To my knowledge we have no complete findings only the seat is found. So we need a interpretation of the legs of the stool. When we have no evidence of the shape of the legs this is my interpretation. The legs can have been turned on a pole lathe but I have no evidence of that. Because we have so many findings of D stools we also have many kinds of woods used. I will say that it is okay to use any kind of hardwood and still call it authentic. For this stool I use black Cherry, I really like this beautiful wood. To make this stool I will use all tools that I have to my disposal. I have made some of this stool using only the "real" viking tools but for this instructable I will make it easy for me... and you if you want to make one also. As I stated in the first step we have so many different findings of the D stool so you are free to make your stool the size that suits your need. If you are not sure about the size you want make a template in paper first or just do like me write on the wood until you get the size you want. Your are going to plan the wood later anyway so it is no problems in scribing direct on the wood. When marking for the legs I first draw a line down the center of the seat, then I make a mark around 10cm from the straight front side. Then I draw a line from the corner to that mark. Then I set a mark 5-6 cm from the edge on all 3 lines. That will place all the legs nicely the same length from the edge. To get the right angle on the legs I strap a piece of scrapwood to the table of the drill press. The seat will lean on the edge of the scarpwood and the table giving all 3 legs the same angle. Now comes the hard part, getting the legs to fit the holes in the seat, we want a tight fit, but if it is to tight and we force the legs in the hole the seat will split and crack. Go slow and be careful not to take of to much wood at a time, if you do that the leg will be loose. And when you dry fit the leg to the hole don't force it in with a hammer or club. If you can't push it in by hand it is to tight and you need to remove a little more wood from the leg. Don't remove any wood from the seat only work on the leg. To make sure the legs don't fall out I will put in a wedge. I use the same kind of wood for the wedge in this stool. But you can use some darker or lighter wood to bring out a contrast for a different look. I sometimes use ebony wedges on a birch stool, that gives a good contrast. Just remember that if you want the stool to be a real copy of a viking stool the ebony is no go. When the legs is cut into length the stool is finished and ready. I gives the stool a coat of linseed oil to protect the wood. The linseedoil will darken the wood a little over time. If you don't want the darkening you can use beeswax or mineral oil. What are the rough dimensions of the seat top? This may be a dumb question, but how thick is that plank of wood, and do you have any suggestions on where to source that kind of thing? Look at step 2, the plank is 4cm thick. I cut the plank I used my self using a chain saw mill. But you can buy planks like it from almost any saw mill. The piece you need is not that big so you can be lucky to find a damaged or spilt plank very cheap. Love this! The simplicity of the design yet very attractive and the exposed joinery is a winner! Great stuff! hi, before i get right into this project i was wondering if there was any way around using a drill press (i only have a cordless makita) also would a 35mm spade bit work just as well as the forstner drill? My favorite part of this instructable is how many hand tools it uses! I love woodworking but don't have money to get any tools so I am working with a jigsaw, some clamps, wood chisels, and a mallet I made. Takes some creativity! 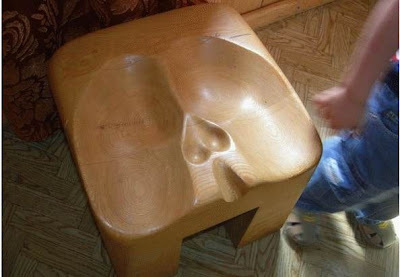 I am going to have to try out this stool! Thank you for this,gonna give it a try myself. That's a bit sexist! - Can I see one designed for females? I guess you are you at an art exposition , isn't it ? LOL, that is a nice shaped seat. How is it to sit on? Nice instructable and nice wood too. Nails were quite expensive and no nails techniques were first choice eg in walser culture in european alps and elsewhere. I sat both on round three legs stools and four legs benches. Three legged are best for rough floors. I have used stools both with no and with a single round hole in the center, same diameter of legs holes so you can easily move it balanced with one finger. If you consider a thickness of 4cm or more and so the weight such holes rounded on both sides for a smoother grab are very comfortables . For more than one finger grab an S shaped hole may be considered enlarging the primitive round hole. I saw one legged stools still on sale in a farming supplies shop in Vallais Switzerland. You just hang it back as you walk around hands free in hand cows milking or tetrapack pouring if you prefer. Wood wedges and wood nails need a just slightly conic holes for best results and you can forget glue in this case. I have seen many tools in places out of context of their intended use yet still usable or even useful. To the previous poster, nothing you say about my personal short comings (You seen to find quite a few.) changes the purpose of the stool. This "common sense" you seem to have dictates that the stool has a multiple use, albeit the most common, as a stool. To which I agree. I do see a probable point of misunderstanding that the Roman bas-relief the previous poster refers to does illustrate a three legged stool but the seat design is not apparent. Yes, three legged stools are common, world round. Again, the purpose of the D shaped seat, is so the milk pail can be drawn up and held between the legs as close to the body as you can. A round seated stool, which still works, is less convenient. The one legged stools I used in milking did the same as they have a minimal seat and provided much bucket clearance. Readers should consider, there must be a purpose in the D shape. The absence of the complete round must mean something. It does and it is known. it is a tool used for a purpose, and as such it is useful for other purposes. However, you should remember that the great advantage of a three legged chair, table or stool is that it remains stable not matter the length of each leg. My grandfather being a farmer used this kind of seating contraption outside as well as inside and he never bothered much about leveling the three legs as the unevenness of the ground made up for the small differences of length between them. Of course when the stool came into the house it was an other matter … much discussed by my grandmother ! !… (but that's an other story !!!…). The author is correct that the stool is from the Viking age however, what is also known is that it is a milking stool. The purpose of the "D" shape was so the milk pail could be brought as close to the body as permitted, then the milker would lean forward, balancing on the two legs and the third would lift into the air. When the milker was done, or the cow is difficult, the milker rocks back away from the cow and onto all three legs again. The average height of a milking stool today, is about thirteen inches, although cows purring the Viking era were shorter. So you might guess that the stool was shorter. When the stool was found by archeologists, none has milked a cow, so they had no idea, that the stool is still in use today an often recognized by dairy men who still milk by hand. It is a tool, for a specific job. Note that a tall "D" stool, would not have occurred. Vikings did use stools, but this one was made for a specific use. I'm sorry to say that I feel you're somewhat overdoing things by confining this stool as a "milking stool". Sure it was used for that. But I can tell you this : in the 50's in France, I saw the same in many houses that didn't have a cow (or a goat, for that matter) it was also used everywhere in the house as a stool to sit by the fireplace and I had my own as a kid in our own house. They were so easy to make that my grand father (albeit furious !…) did make a new one in no more than a full hour !… This stool was my first woodworking project I did with hi. I was 11 or 12 and I remember it took me a whole afternoon under his guidance (a very fond memory as you may guess). Moreover different regions in France (and Europe) had various traditions in milking (by hand) : where I was born and raised (in the east of France) the milking stool had only one leg (!) and it was mainly used as a resting contraption on which the farmer's wife remain balanced while milking. It was not a sitting "tool" but it was used as well as the manner you describe milking. Then again you are a little too hard with archaeologists ! Sorry to say but it also shows how little you know of them. First, many archaeologists from my generation (and before) have been raised in farms and know about milking by hand as much (or more) than you do because milking the one or two family cow(s) may well have been their daily chore after school. Second, many younger archaeologists raised in cities are keen to learn "how to" from older country people as their experience is invaluable in their work. Remember that the best paleontologists understood how the stone age men worked by learning from the last tribes in the rain forest or simply by hit and miss trials with silex and other stones : sharpening and / or polishing a stone to make an ax or an arrow spear asks for as much talent to day as it did 10 000 years ago ! As I do agree that this stool is not more Viking than it has been Gaelic or Iberic, it does not make it more "milking stool" than what it is : a stool so common that it has been seen in all civilization where not sitting on the ground was essential, and that has been in existence almost everywhere since the first guy who understood that the more stable sitting "tool" was three legged : if my memory doesn't fail me, there is one Roman bas-relief showing a woman from the aristocracy sitting on a three legged stool (and no cow !!!…). So a "milking stool" if you please, inasmuch as it is not confined in the stable and has numerous uses in the house, the garden, the porch … and is made in an hour from any plank and three branches chopped of a tree. Simple as that. Love this project. Well done on the photos and instructions. This will be a great project to do with my kids and maybe even the boy scouts. Thank you.